ATTN: AutoTek products ship direct from AutoTek, No funky Ebay stuff, No funky warranty policies. No blatant rip-off shipping charges. No matter what, your speakers are the final and most important link in any hi-performance car audio system. It is this mechanical device, than converts the amp's hi-power to sound waves. 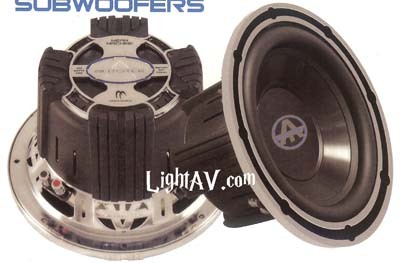 A subwoofer system is the most important upgrade you can make to your car audio sound system. Autotek subwoofers come in a variety of voice-coil configurations and frame sizes. If your goal is to add bass to an OEM factory sound system, or build an award-winning competition car audio system, Autotek has the perfect subwoofer for you!